Nice soft leather, phone fits perfectly. Thats all you need to know about the case. Quick delivery. Worth the money. This case is very good value and protects the phone well. Neat and slim wallet that protects phone well at sensible price. Pity about delivery charge which always takes the edge of Mobile Fun’s value for money. Description on website is accurate,told me it would be suitable and is,pleased with purchase. This is an excellent product. It protects my phone whilst retaining a slim profile. It does what it is supposed to. My second cover, the first started to fray after 9 months, looked around but still the best deal I could find. Makes the phone looks smarter and takes heavy knocks. Great service and the wallet/cover gives my phone the look and protection I was hoping for and at a reasonable price. This product holds the phone securely, and adds very little to its bulk. 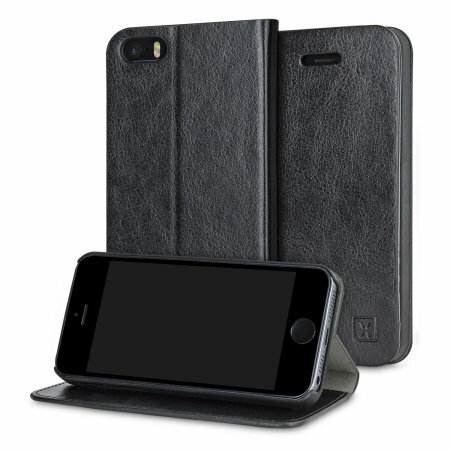 It provides good protection, although the cover tends not to lie completely flat. The two pockets are pretty useless and are more a design feature than of practical use. Altogether, I’m pleased with the product. This is the second Wallet cell phone case I have ordered. Loved the first one so much, I ordered one for my second Apple I Phone SE. I now have one on my Apple IPhone 4 and my Apple SE. Great protection for phone, fits tight on each as it should. So slim I now carry my phone in my right front pocket and not strapped to my belt. Great product at a great price. Very good service though delivery a little slower than expected. I wasn't as happy with the quality of this case as with previous more expensive ones. Have had to have it replaced after only a month of use was falling apart, service and replacement excellent with company however have put old case from a previous phone on it as this case didn't sit properly on it to close. Would not buy again. Got onto MobileFun after buying a phone with Giffaff. A fairly friendly website with impressive prices and delivery costs. The case fits the iPhone very well, looks good and helps to protect my investment. Delivery was brilliant no delay and on time. Bought this for my wife and she loves it,well made and protects the phone without making it too bulky,the little pockets are handy for storig reminders and the like[her memory isn,t what it used to be]but yes she only has good to say about it. Goods received 9 May 17,in excellent packaging,and goods as advertised and good quality. Excellent fitting for my iphone. Would deal with company again. So far this case has been everything I expected it to be. I love this case! It has a simple, clean, quality design. It's exactly what I wanted. I can throw in a couple business cards, my licence and go. I bought this iPhone case because it's got a front cover. Brilliant case for full protection of your valuable phone. Super fast delivery. Purchase with confidence. I have bought a few items from Mobile Fun and have ALWAYS had excellent service. i bought my iphone se leather cover from the website, received the product in less than estimated time of arrival. great customer service and beautiful product received in good condition. thank you mobilezap! This item was just what I required to protect my new iPhone. Very pleased with the colour, quality and the speedy delivery. Do hesitate to purchase if you need complete protection for your iPhone. I have bought a few items from this company and have had the usual excellent service provided. Finally found a case for my new iPhone SE, no one seems to do these cases yet?! As I'm clumsy and accident prone I needed a case that would protect my phone and this one is perfect! Even dropped it and it landed open & face down and it still protected my phone - not a scratch!